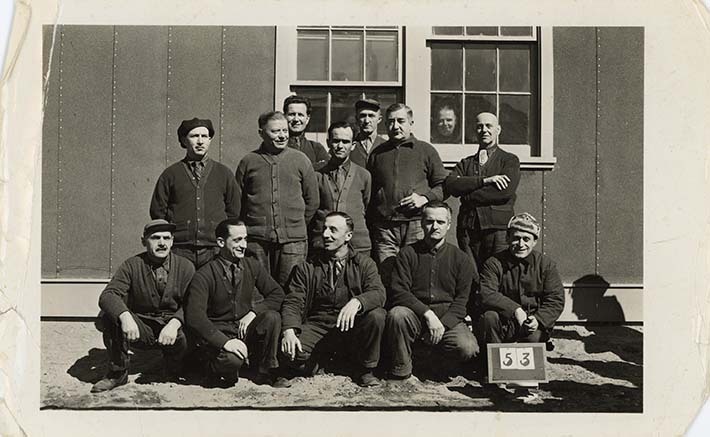 Photograph of 13 internees; five are crouched in the front and one is visible through a window panel. All seem to be wearing heavier clothes suggesting the picture was taken in early spring or in the fall. An identification card reading "53" is positioned on the ground in front of the internee at the far right. The group is positioned in front of a building whose facing seems to be comprised of studded wood planks. This photograph belongs to a collection owned by Italian Canadian internee Ruggero Bacci, crouched second from the right. The same image appears in a collection owned by Gino Tiezzi, who is crouched second from the left. The man standing in the middle of the second row has also been identified as Donato Sansone. Duplicate prints of this image are held in the ICEA collection (ICEA2011-0085-0004, LDICEA2010.0001.0003). One of these images held by the Archives of Ontario seems to have been erroneously dated to June 1942.